Aerospace students Jesse Cummings, Rebecca Foust, Christopher O'Hare, Michael Cunningham, Scott Wingate, Jason Burr, Dylan Carter and faculty advisor Dr. David Akin. 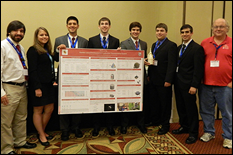 The Department of Aerospace Engineering's undergraduate Revolutionary Aerospace Systems Concepts - Academic Linkage (RASC-AL) team won second place overall at the 2013 RASC-AL design competition held June 18-20 in Cocoa Beach, Fla. The team's design of Modular Affordable Mixed-Fleet Architectures and Programs for Sustainable Human Exploration earned them high honors, just behind Virginia Tech. The team consists of faculty advisors Dr. Dave Akin and Dr. Mary Bowden and undergraduates studying aerospace engineering. Students Jesse Cummings, Rebecca Foust, Christopher O'Hare, Michael Cunningham, Scott Wingate, Dylan Carter and Jason Burr represented the team in Cocoa Beach where the group faced universities from across the United States, including Georgia Tech, the University of Illinois-Urbana Champaign and the University of Colorado at Boulder. The RASC-AL is a student design competition sponsored by NASA and managed by the National Institute of Aerospace. This competition offers an opportunity for engineering students to design solutions for real engineering challenges faced by NASA. Each design is judged based on several criteria: mission rationale, innovative capabilities, key technologies, human safety considerations, and overall planning and professionalism of the project. To compete, the team was required to submit a 15-page technical report on their design and conduct an education and public outreach activity prior to attending the event. In addition, the team had to prepare a poster and present a 30-minute oral presentation to the competition's Steering Committee consisting of NASA, industry and university experts. The team's second place victory provided funding to the team to present their design paper at the AIAA Space 2013 conference held September 10-12 in San Diego. In addition to placing second overall, the team also won 'Best in Theme' for the Human Lunar Access and Initial Exploration Category and placed second in the Undergraduate Division. Clark School Dean and Nariman Farvardin Professor of Aerospace Engineering Darryll Pines said, "Over the years these teams have had an incredible track record of success. Competing successfully has become a hallmark of our Aerospace Engineering program as well as all of our programs in the Clark School of Engineering." The team will be closing out their 2013 SSL academic competition season by competing in the NASA Lunar Wheel and AUVSI Robo Sub competitions in July. For more information on the RASC-AL competition, visit their website. For more information on faculty advisor Dr. David Akin, visit his faculty profile. For more information on faculty advisor Dr. Mary Bowden, visit her faculty profile.